Blue oak (Quercus douglasii) is a characteristic oak of the lower elevations of the Sierra foothills and coastal mountains, its range essentially encircling California’s Central Valley. Based on its reported range, Upper Las Virgenes Canyon Open Space Preserve (formerly Ahmanson Ranch) contains one of the southernmost populations of blue oak within its range. However, the predominate deciduous oak in the area is valley oak (Quercus lobata), and occurrences of blue oak appear to be rare. Regional climate modeling suggests that over the next century the range of blue oak could shift northward and diminish to nearly 60% of its current range. Blue oak is reported to hybridize with valley oak, however a 2005 study suggests hybrids of these species may be more rare than generally accepted. 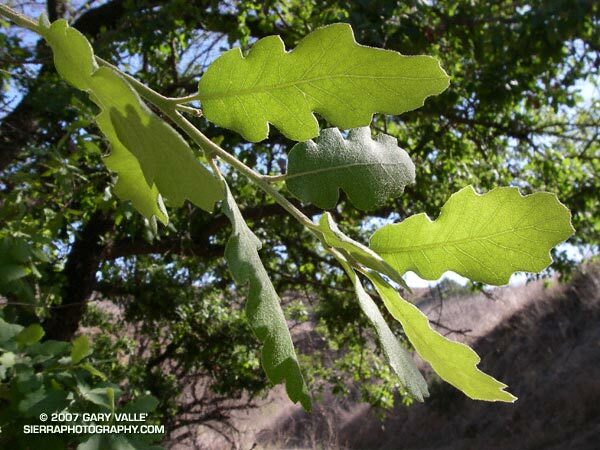 The photograph of the leaves of a blue oak was taken on a run along East Las Virgenes Canyon to Lasky Mesa on April 24, 2007. A valley oak immediately adjacent to this blue oak was killed in the 2005 Topanga Fire. Modeled regional climate change and California endemic oak ranges. Kueppers, L.M., M.A. Snyder, L.C. Sloan, E.S. Zavaleta, and Brian Fulfrost. 2005. Proceedings of the National Academy of Sciences of the United States of America, 102(45): 16281 – 16286. Limited hybridization between Quercus lobata and Quercus douglasii (Fagaceae) in a mixed stand in central coastal California. Kathleen J. Craft, Mary V. Ashley and Walter D. Koenig. American Journal of Botany. 2002;89:1792-1798.